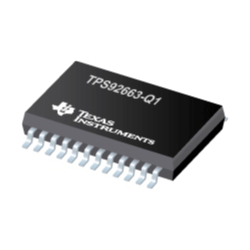 The Texas Instruments TPS92663-Q1 LED matrix manager device enables fully dynamic adaptive lighting solutions by providing individual pixel-level LED control. The device comprises two sub-strings of three series-connected integrated switches for bypassing individual LEDs. The individual sub-strings enable the device to accept either single or multiple current sources. It also provides a parallel connection of two switches to bypass high-current LEDs. A master microcontroller may be used to control and manage the devices through a multi-drop UART serial interface. The serial interface supports the use of CAN transceivers for a more robust physical layer. An application can use the TPS92663-Q1 device and the TPS92662-Q1 device on the same bus. An on-device, 8-bit ADC with two multiplexed inputs can be used for system temperature compensation and used to measure a binning value which allows for LED binning and coding. The internal charge pump rail supplies the gate drive voltage for the LED bypass switches. The low on-resistance (RDS(on)) of the bypass switch minimises conduction loss and power dissipation. The phase shift and pulse width for each LED in the string are programmable. The device uses an internal register to adjust the PWM frequency. Multiple devices can be synchronised. The switch transitions during PWM dimming operation have a programmable slew rate to mitigate EMI concerns. The device features open LED protection with programmable threshold. The serial interface reports open LED and short LED faults.